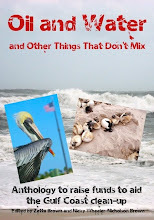 Following is the third in a periodic series about the careers and recent activities of artists I have showcased in my monthly Artist Watch column at the online arts magazine Escape Into Life. Congratulations to all on their many noteworthy successes! 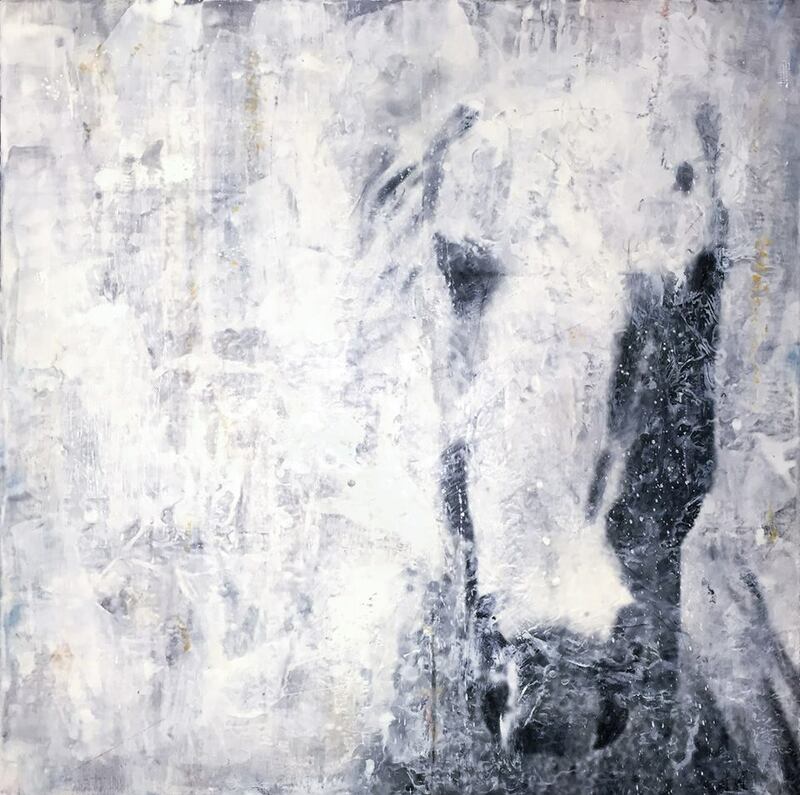 ★ Clare O'Neill, Minnesota (December 14, 2014, Artist Watch) ~ Clare's 36" x 36" photo encaustic on wood panel, Fly, has been selected for inclusion in the "National Parks: Personal Narratives" exhibition at The Phipps Galleries, Phipps Center for the Arts, Hudson, Wisconsin. The show runs from October 21 through November 27, 2016. 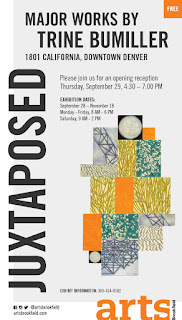 Earlier this year, Clare served as juror for the 2016 National Juried Photo Encaustic Exhibition (see images) at Sage Gallery, Portland, Oregon. Clare also facilitated the a photo encaustic workshop at the gallery in June. In addition, Clare was the featured photo encaustic exhibitor in August in the Reedy Gallery at Minnesota Landscape Arboretum, Chaska, Minnesota, where on October 29 and 30, she is teaching a sold-out workshop, "Where Photographs Meet Beeswax: Contemporary Photo Encaustic". 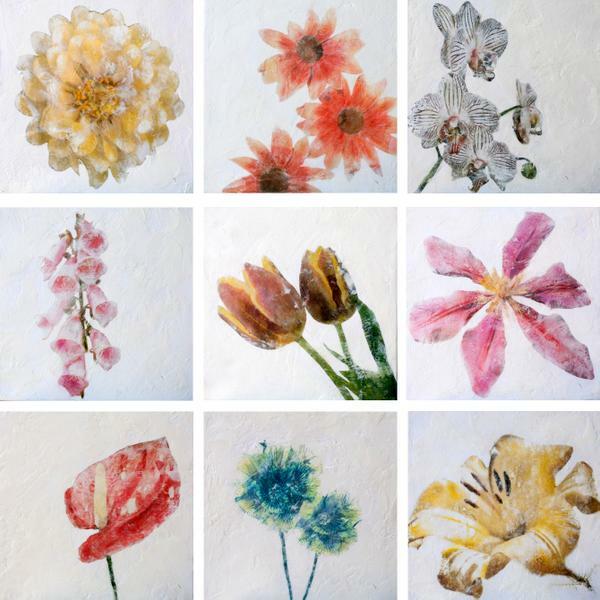 In addition, Clare's newly completed series of photo encaustic flowers (see image below) is featured with work by five other regional artists in "Mind Your Beeswax", on view in the Reedy Gallery through October 31. ★ Nicola Slattery, Norfolk, England (September 18, 2014, Artist Watch) ~ Nicola's paintings Book of Cats, Night Cat, Call of the Wild, and The Magician's Cat were included in a group exhibition, "The Hidden Paw", at Fosse Gallery Fine Art, Stow on the Wold, Gloucestershire, England, in September. (See images at the exhibition link.) In addition, two of Nicola's paintings, Crown of Birds and Norfolk Couple, and four limited-edition drypoint prints were exhibited in "Works by Selected Members of the Royal Society of British Artists", which concluded yesterday at The Bircham Gallery, Holt, North Norfolk. ★ Trine Bumiller, Denver and Fraser, Colorado (August 15, 2013, Artist Watch) ~ An exhibition of Trine's major paintings, "Juxtaposed", is up through November 18 at Arts Brookfield, Denver, Colorado. 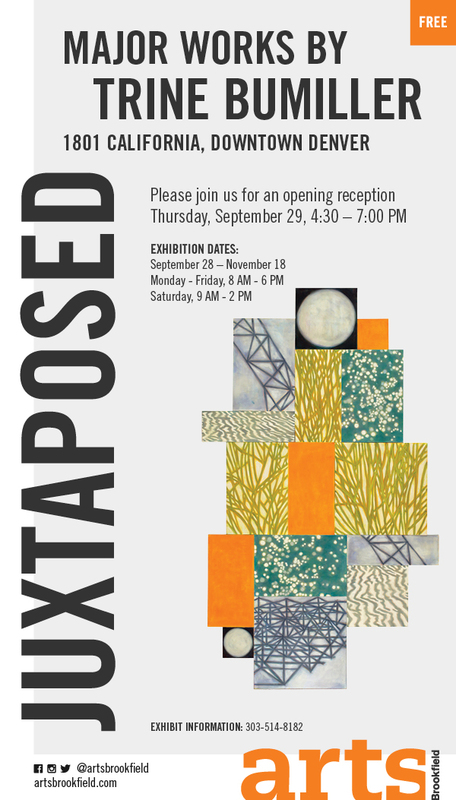 See the exhibition link above for details or click on "Juxtaposed" image below. Trine also is showing through November 13 in "Looking Back: 40 Years/40 Artists" at Arvada Center for the Arts and Humanities, Arvada, Colorado; and she will have a show in New York in January 2017. She's on a roll! ★ Andrea Kowch, Michigan (June 19, 2014, Artist Watch) ~ Andrea's work is discussed in an interview filmed and produced by Paul Briles. Titled The Courtiers, the film goes behind-the-scenes with Andrea for insights into her artistic process and inspiration. See the film at RJD Gallery online. ★ Shell Rummel, Virginia (March 17, 2016, Artist Watch) ~ A collection of beautiful rugs and pillows with Shell's designs recently was featured on the Instagram page of Surya, one of her design partners. Her Sea Glass Mosaic bed sets, which have coordinating decorative pillows and quilts, are at Bed Bath & Beyond online (see Shell's bedding line). Another of Shell's collections, Soft Repose, is going to retailers soon, and her designer signature colors have been picked up for the Prestige Paints ColorPic app featured at Design Milk (see Shell's paint line). ★ Salma Arastu, Berkeley, California (January 16, 2014, Artist Watch) ~ Salma is the recent recipient of a $3,000 Civic Arts Grant from the City of Berkeley. ★ Kazaan Viveiros, New Jersey (May 15, 2014, Artist Watch) ~ A selection of Kazaan's paintings can be seen through November 1 at Umbrella Decor, Hopewell, New Jersey. Her Woodpecker Overlook is in the "87th Annual Exhibit" at Phillip's Mill, New Hope, Pennsylvania, through October 29. Kazaan, who is an advocate for environmental justice, sold her triptych The Birds at the 20th Anniversary Party of Earthrise Law Center, Portland, Oregon; she recently began working with environmental organizations to fundraise and promote "the idea of artists as stewards of the Earth." See Kazaan's paintings at Page Bond Gallery, Richmond, Virginia.